Sailing in Turkey puts you at the crossroads of history, culture, geography and religion. This vast peninsula is surrounded by eight countries and on three sides by the Aegean, Black and Mediterranean seas. It’s one of the world’s oldest inhabited regions, a former home to Assyrian, Greek and Phrygian civilizations, among others. With more than 500 islands and islets and 4,400 miles of coastline, it is no wonder Turkey is a sailor’s paradise. Turkey’s culture and history is as ancient and diverse as its geography and climate. Homer’s poem “Odyssey” is set in Turkey and the infamous Trojan wars were fought there. The capital was known as Byzantium by early Greek settlers before it become part of the Roman Empire and renamed Constantinople after Constantine the Great. When Rome fell, Constantinople became the center of the Byzantine Empire before the Seljuk Turks ruled for nearly 200 years. After the Mongols invaded and the Ottoman Empire was swept away at the end of World War I, modern Turkey was born in 1922. The Bosphorus separates the European part of Turkey from the Asian region and its geography means the country has a rich biodiversity with hundreds of parks and protected areas. 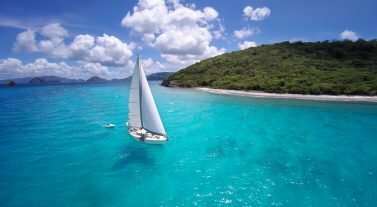 The coastal areas are a prime sailing region with a Mediterranean climate and hot, dry summers, as well as calm waters and kind winds. When it comes to mooring fees in Turkey, many bays have restaurants and a jetty. You can moor here free of charge, although you will be expected to buy a meal from the nearby restaurant, which may be a more expensive than restaurants without a jetty. If you find a sheltered cove, you may struggle to drop anchor as many are very deep. For conservation reasons, mooring using trees is not encouraged although many coves have mooring bollards or rocks with rings in which you can use instead. 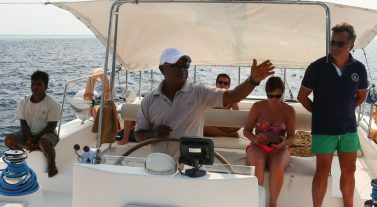 Dream Yacht Charter in Turkey: Browse our bareboat fleet of catamarans and monohulls in Turkey. 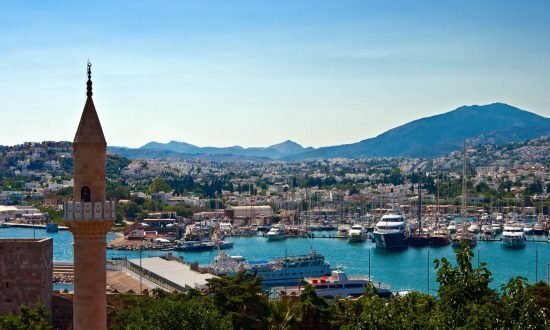 Our base is in Göcek D-Marin Marina. It has restaurants, bars, showers and Wi-Fi and you’ll be greeted by our friendly and knowledgeable team. If you want to sail Turkey, check out our inspirational itineraries section and get in touch with our team to find out more. The time difference in Turkey is Coordinated Universal Time (UTC) +3 hours. Make sure your documentation is in order to travel. Talk to us to make sure you have the correct documents before you travel. You can travel around Turkey by taxi, which have meters but make sure they are set when you start and to the correct rate for the city. Or you can travel by share taxis and minibuses that work on set routes and are more comfortable than a bus. For specific information about restrictions, visit the government website for information. The currency is Turkish Lira (TL) although many places will accept Euros, US$ and sterling, although you should be aware of exchange rates to ensure you are getting value for money. We would not recommend changing currency at the airport, as the rate given is very poor. Visa and MasterCard are accepted and ATMs are easily found. Banks are open Monday to Friday (9am to 12pm and 1:30pm to 5pm). Getting online is easy with plenty of Wi-Fi spots all over Turkey that are usually free. 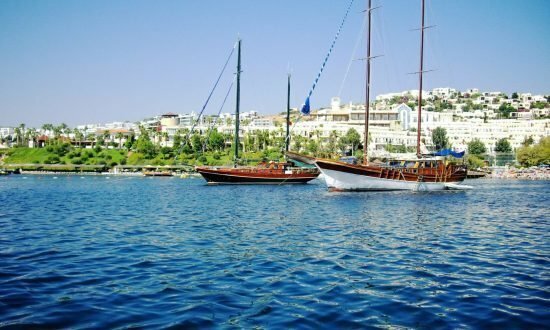 Turkey has a long sailing season between April and November. 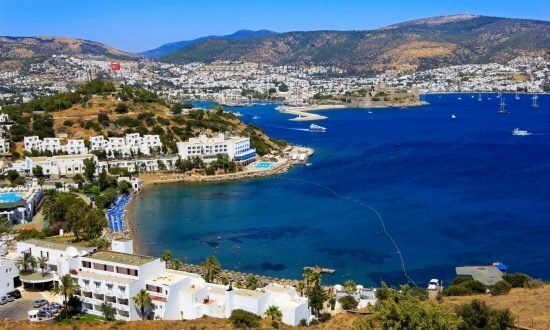 Temperatures in Turkey around the Aegean area are around 86ºF/30ºC in summer and 77ºF/25ºC in spring and fall. 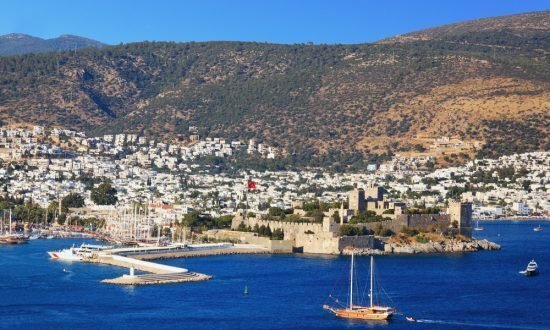 The sailing conditions in Turkey are characterized by the meltemi wind, which blows from the NW to WNW in open waters, but follows the coastlines nearer to shore. Average wind speed is Force 2-4 in the summer season but occasionally, in the high season, gusts can reach above Force 6-7. Outside the season, the meltemi is less powerful with even several days of light winds can be expected. Usually the wind will pick up early in the afternoon, which is ideal for anchoring, although sometimes the meltemi continues during the night. Day 1: Make sure you leave enough time to explore ashore at Göcek, a small fishing town that used to known as Kalimce. Explore the forested national park or trace its past underwater and see the Kalimce ruins. Provision from the local market on Sunday or try the fresh seafood in one of the local restaurants. Head eight nautical miles to Kapi Creek, Gobun Koyu, in the Skopea Limani gulf between Göcek and Fethiye – known as one of Turkey’s most beautiful cruising regions. Kapi Creek is a scenic, protected cove sheltered by trees that frame cobalt and azure waters. It’s known for its boat accessible Kapi Creek Restaurant, which is also a bakery and has fantastic sunset views. Moor at the jetty, swim at the nearby beach, explore Merdivenli Cove and Seagull Bay or head to the hills to see ancient ruins. Day 2: Set sail 29nm up the coast to Ekincik, between Marmaris and Dalyan. Ekincik has a beautiful, sheltered marina set in an inlet with a beach, pine forests trails and caves to explore. Take the local motorboat ride up the Dalyan River to the UNESCO ancient city of Kaunos, where you’ll see six tombs of the kings cut into the sheer rock face. Don’t miss it, as it really is spectacular. You can also visit the nearby mud baths with their mystical healing powers. Day 3: Head 34nm to Gemiler Island, also known as St Nicholas Island, where the tomb of St Nicholas, or Father Christmas, was believed to have been originally located. Climb the very steep hill to see the ruins of five churches built between the 4th and 6th centuries, one of which is cut into the rock. There are impressive views at the top, but wear sturdy shoes and take plenty of sunscreen and water with you. The ruined arches provide natural frames for views of electric blue seas sparkling in the sunshine. This is a popular spot, so early mooring is advisable and if you want to swim off the beach, wear water shoes as there are rocks underwater. Day 4: Sail 13nm to Kizikuyruk Koyu on the Kapıdağ peninsula, a deep anchorage and beautiful cove with clear water for snorkeling. Day 5: Make for Fethiye (13nm), which is a wonderful gateway to explore Turkey’s rich archaeological treasures and the Antalya ruins with their rock tombs that formed part of Lycia’s ancient settlements. There are plenty of mooring opportunities and some hotels reduce the mooring fee if you dine. Just a 20 minute walk away from the harbor is the Amyntas rock tombs. If you have more time, the amazing, well-preserved settlement of Pinara is just an hour by taxi, followed by a winding walk up the hill. It sits in the mountains with tombs cut into high rocks, many with columns and motifs, or you can wander the amphitheater. Some of the site requires climbing, so wear the right footwear for scrambling.Or you can visit the Tlos ruins with its amphitheater, roman baths and mausoleum cuts into the rocks. You can also see the ruins at Xanthos and Kalkan. It gets very hot in summer, so make sure you stock up on water when you visit the ancient sites. Day 6: Sail 15nm to Wall Bay, which offers some of the best snorkeling in this part of Turkey. Dine at the nearby family-run restaurant Adaia, which can only be accessed by boat. Swim at the beach or kayak to the nearby Cleopatra’s Bay (also known as Ruin Bay) to explore ancient ruins. Day 7: Head nine nautical miles back to Göcek and disembark. Our Göcek Base Manager (see our Useful Downloads section for details), will be pleased to welcome you on arrival. Fly via Istanbul to Dalaman Airport (DLM) from New York with Turkish Airlines or to Antalya Airport (AYT) from Los Angeles with Aeroflot or Turkish Airlines. 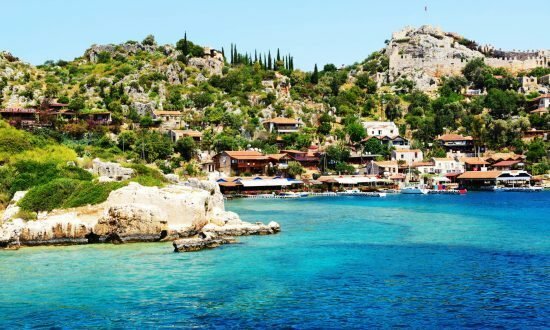 Dalaman is 25 minutes from our base by taxi and Antalya is 3 hours away. We can arrange airport transfers on request. Make sure your passport is in date and valid for the duration of your stay and look under our Handy Info section for visa advice!